The Manger Bedroom is decorated in soft beige toile and petite checks reminiscent of France. The bank of windows above the king size bed looks out onto the garden courtyard. Dramatic angles provide an interesting architectural element to the room as its ceilings soar upward. The two window seats provide a stunning view of the mountains. Two comfortable chairs are perfect for viewing the fireplace or watching TV. And of course, the whirlpool in the bathroom offers the relaxation one needs at the end of the day. The East Bedroom is a stunning and masculine bedroom, with honey colored wood working that surrounds the fireplace. The large leather sofa makes for comfortable relaxing. A stone floor accented with plush oriental rugs makes this spacious room that much more luxurious. Two large patio doors open onto a flagstone terrace where you can enjoy the sunrise or sunset over the mountains. The whirlpool tub is tucked into the cozy but spacious bathroom. The four poster king size bed adds to the luxury. The built-in kitchen closet houses a small refrigerator, microwave and coffee maker offering you the convenience of sleeping in and having your continental breakfast when you please. The East Bedroom is our handicap unit. The Dovecote Bedroom is bright and cheerful, with white and beige and splashes of red. 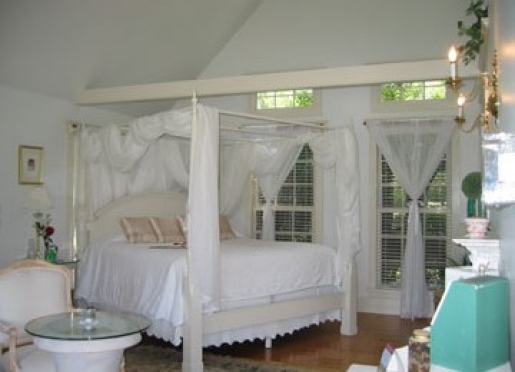 The king size bed is subtly draped in sheer fabric to resemble the look of a four poster bed. You can enjoy the fireplace from the king size bed or watch TV. Two elegant wing chairs provide an enjoyable sitting area, perfect for reading the many magazines we provide or that good book you brought with you. The balcony is the perfect spot to enjoy the breakfast that has been left in the kitchen closet in your room. 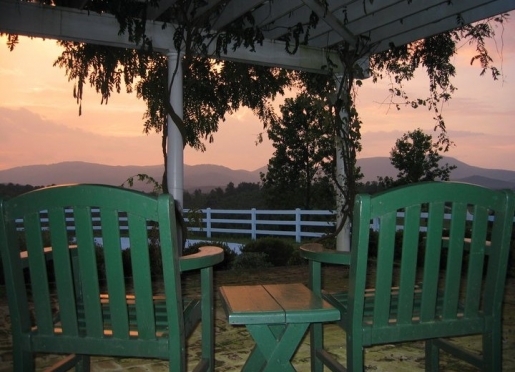 You can view the sunrise or the sunset over the mountains from your private balcony. And don't forget, the whirlpool tub is waiting to be enjoyed in the spacious bathroom. 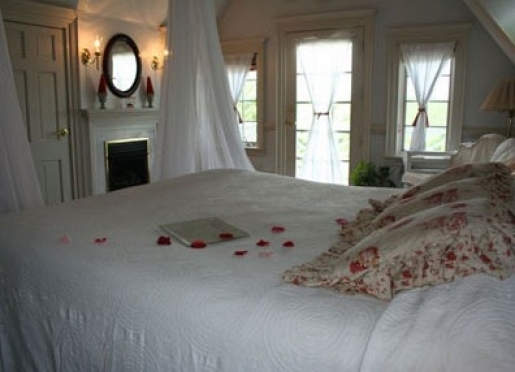 The Croft Bedroom is our most romantic of the Inn Rooms. Architecturally interesting, it is in the crook of the building where the rafters join and form interesting angles. Sheer fabric drapes from the beams create an ethereal and romantic atmosphere. Decorated in all white and beige, the brass bed rests its head against a bank of three windows that capture the mountain view. Two cream colored wing chairs sit in front of the fireplace, the perfect place for enjoying your in-room breakfast left for you in the kitchen closet. A white marble bathroom houses the whirlpool tub just waiting for you to come and relax the cares of the world away. The Gable Bedroom is our most sought after room and known for its dramatic views. 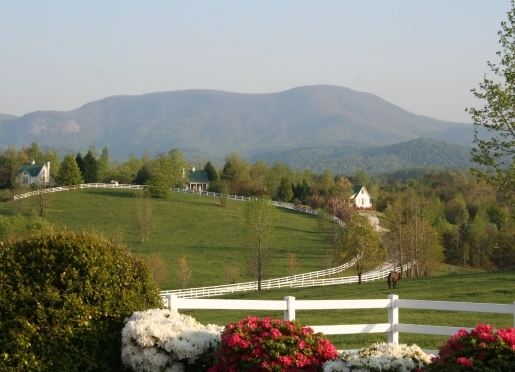 Located in the northwest corner of the Inn, each window holds a gorgeous mountain view. The window seats will invite you to curl into the cubby with the soft over-sized pillows and gaze out to the Blue Ridge Mountains. Decorated in soft greens of velvet, satin and cottons, it is sophisticated, yet understated. The king size bed is draped with sheer fabric, adding an element of pure romance. Enjoy the fireplace from the bed or gaze out to the balcony where tomorrow morning you can savor your breakfast which awaits you in your own kitchen closet. The over-sized bathroom holds the whirlpool tub, the perfect spot to relax in after a day of trail climbing to the waterfalls. The Aviary Bedroom hosts a lovely Oriental flavored triptic of birds in flight. Blue and yellow toile, plaids and stripes give a bright and cheerful feel in contrast to the stately aviary prints. A cozy fireplace sitting area is the perfect place to enjoy reading about the fifty waterfalls for which the area is known. Two window seats look south over woodlands and distant pastures while the remaining two overlook the fish pond in the garden courtyard. A lovely view of the mountains can be enjoyed from the windows in the bath before taking that long soak in the whirlpool tub. Most people can't believe that this bedroom. When you lay your head down at night you will find yourself pleasantly inspired by the beautiful writings of love and romance artistically inscribed on the parchment-like walls. The spacious whirlpool tub in the bath is complemented by plush over-sized towels. Sunrise from the front porch is awe-inspiring and sunset from the deck off the bedroom is a reverent experience. There is also an outdoor hot tub. Light and airy, The Springhouse is surprisingly calming with the soft green color scheme. A forest mural surrounds three tall gothic arched windows that lead the eye beyond to the blue mountains. The furniture is artistically distressed, giving it an antique appeal. The private deck off the bedroom provides the perfect resting spot after a long day hiking in the mountains, walking the trails or antiquing in town. It is our special cottage, as the deck leads to your own private outdoor spa. This two-person jetted spa is the perfect place to view the stars at night! The spacious deck also provides two luxurious lounge chairs. The collection of blue and white plates, candlesticks, and bric-a-brac sets a tone of elegant sophistication. 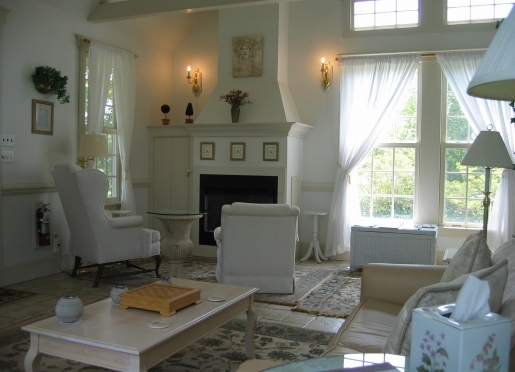 The blue and white color scheme is carried throughout the cottage with decorator chintz pillows and toile wallpaper. The pair of blue velvet high-back wing chairs in front of the fireplace offer quiet repose. Morning glories tumble down the walls of the bedroom, adorning the white four poster bed it seems natural that morning glories grow outside the bedroom window. From the bedroom you can watch the horses graze in the pasture or doze in the barn. Outside you can inhale the view and delight in the pond filled with Japanese koi, enlivened by the sound of the gurgling fountain. Or, enjoy the relaxing warmth of the spa hot tub on the deck, very romantic! This is the best, most luxurious place to view the stars at night or enjoy the view during the day. A fox hunting mural runs the course around the walls of the living and dining rooms of the Carriage Bay Cottage. Fox hunting pictures and memorabilia decorate the entire cottage and you can read "the spirit of fox hunting" on the bedroom walls. Warm rich plaids add a cozy atmosphere. The fireplace nook is a perfect spot to enjoy an "ordered in" four-course picnic for two at the end of the day. The upstairs loft sports a comfortable sofa for cuddling or watching TV. The luxurious whirlpool tub can soothe and renew and remind that it's vacation time. The expansive deck off the western side of the cottage is the perfect spot for sunning and taking in the glorious views. The private deck off the bedroom is perfect place to lazily wake up and enjoy your morning coffee and croissants. The private deck off the bedroom provides the perfect resting spot after a long day hiking in the mountains, walking the trails or antiquing in town. It is our special cottage, as the deck leads to your own private outdoor spa. This two-person jetted spa is the perfect place to view the stars at night! The spacious deck also provides two luxurious lounge chairs. Quiet and spacious, the Springhouse lets you sleep feeling pampered on our luxurious king-size bed. 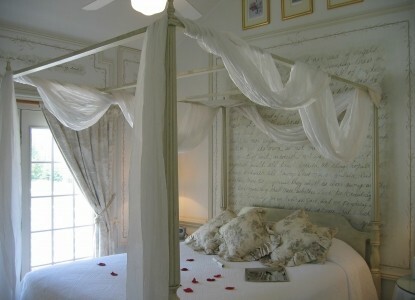 You can view the fireplace and the mountain view from the romantic four poster bed draped in sheer fabric. Great place for a couple or a family. $245 per night or $295 per night for a family of 4. Detailed woodworking dominates the decorating of the Huntbox Cottage. Dark wood tones and leather look wing chairs provide the feeling of warmth and cozy comfort. Stone-like tile floors are covered with deep red oriental rugs. The upstairs loft provides a leather-like sofa bed, perfect for snuggling or stretching out with that great novel you've meant to read. The theme of the 1066 Normandy battles decorates the fireplace mantel and adorns the bed pillows. The overall feel of the cottage reminds one of an old English library. The whirlpool tub in the spacious bathroom adds that extra special touch to this already luxurious cottage. This cottage is great for couples or families! Six luxurious Inn rooms surround the garden quad. White clapboard houses with green tin roofs dot the distant hillsides. Rocking chairs beckon to be filled by relaxing and contemplative guests. Our six charming cottages may be reserved to house those staying for overnight retreats. Reserving accommodations at The Red Horse Inn constitutes and creates a legally binding contract, whether you reserve orally or in writing. By accepting your reservation, we agree to hold the room, cottage or other facility for you on the date(s) requested, and to turn down other requests for the same accommodation on those date(s). By requesting the reservation, you agree to pay for the accommodations and date(s) you have reserved. Therefore, date changes are considered cancellations, to which our cancellation policy applies. Our cancellation policy permits a 50% rebate of the deposit if more than 7 days notice is given prior to the originally reserved day of arrival. No shows and cancellations within the 7 day period forfeit the entire amount of the stay. Check-in is 4-6 pm (please let us know if you will arrive after 6). Check-out is 11 am. If a second bed needs to be made to accommodate two singles, an extra $25.00 per day fee is charged. The prices do not include daily housekeeping which is optional at $25.00 per day, however, housekeeping is required by the third day. Guests staying one week in one of our cottages receive one night free. Note: Inn Rooms include daily housekeeping in the price, but do not receive the weekly discount of one free night. If a family of four (two adults, two children) is traveling together, the Huntbox Cottage may be reserved for only $270 per night, before tax. The East Bedroom is a stunning and masculine bedroom, with honey colored wood working that surrounds the fireplace. The large leather sofa makes for comfortable relaxing. A stone floor accented with plush oriental rugs makes this spacious room that much more luxurious. Two large patio doors open onto a flagstone terrace where you can enjoy the sunrise or sunset over the mountains. The whirlpool tub is tucked into the cozy but spacious bathroom. The four poster king size bed adds to the luxury. The built-in kitchen closet houses a small refrigerator, microwave and coffee maker offering you the convenience of sleeping in and having your continental breakfast when you please. Comfortably priced at $205 plus tax. The Stables Cottage is unique among South Carolina bed & breakfasts. 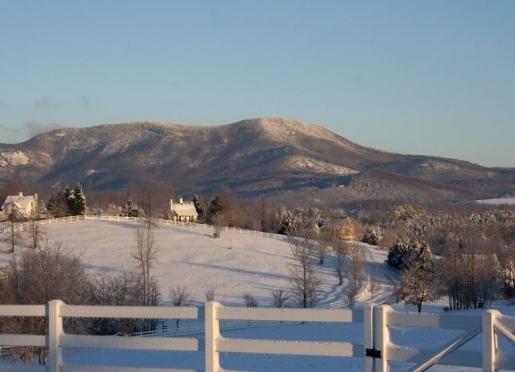 This upstairs accommodation is great for a romantic weekend cabin getaways, but it's also one of the best available luxury pet-friendly cabin rentals in the Blue Ridge Mountains area. 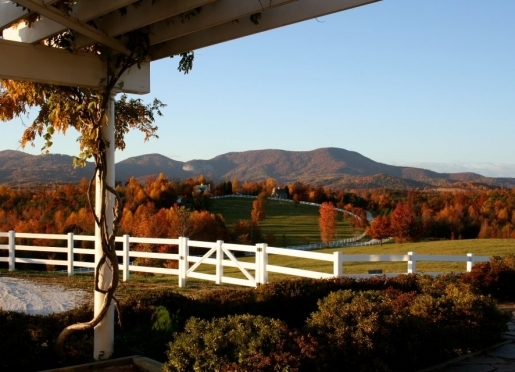 When considering cozy cabins, NC pet-friendly travelers and SC travelers agree: The Stables Cottage is perfect for romantic anniversary vacations and all great weekend getaways, Southeast-style. 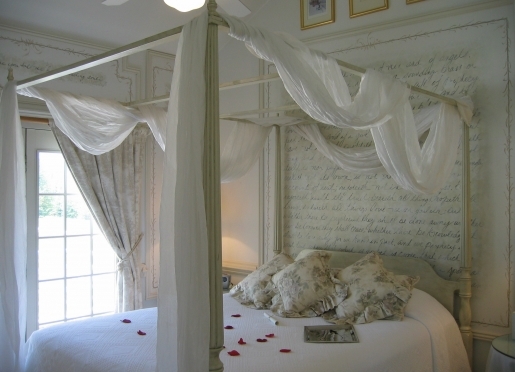 The Stables Cottage has four lovely gables with soaring ceilings, one of which houses the lovely queen size four poster bed with sheer fabric, making it just as suitable for romantic winery getaways! From the bed you can view the fireplace and sitting area, complete with TV with DVD player. Another gable houses the kitchenette (where, of course, your jumbo muffins, fresh fruit parfaits, egg casseroles, oatmeal, grits, coffee, tea and juice will be waiting in your fridge). The bathroom fits luxuriously in the last gable and is complete with a large shower stall, sink, vanity and plenty of room to lounge. 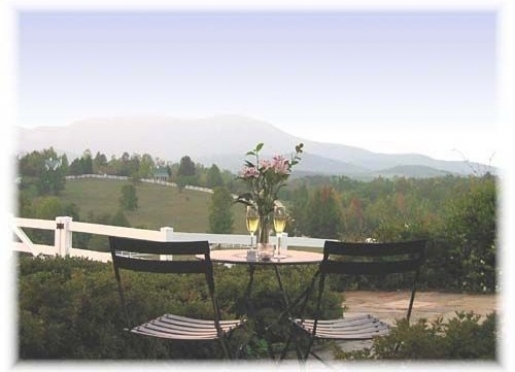 The mountain views are best from the bath or your very own front porch, complete with rocking chairs. And that's the best place to have a conversation with our two percheron horses, Bob and Beau Coup, who will gladly accept your carrots and apple cores. You might also get a visit from Scooter, a long haired white Persian cat who likes dogs, horses and people! And, like all of the rooms and cottages, there's AC! But no phone or Internet - which most guests appreciate from bed breakfast inns, anyway! This is our only pet-friendly cottage. 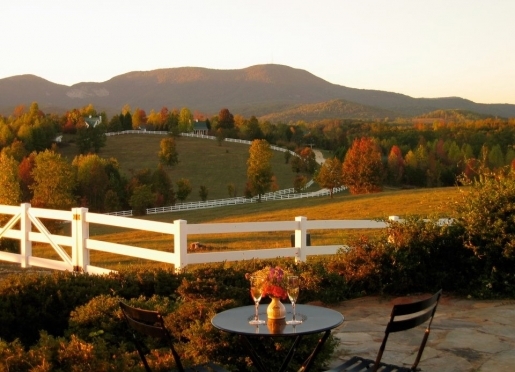 $210 per night plus $25 per furry friend (clean fee), a $50 refundable deposit... and Uncle Sam's portion, of course. Thank you for making an inquiry about staying at The Red Horse Inn Bed & Breakfast.